We are a growing community of faithful traditional Anglo-Catholics, young and old, committed to following the teaching of Our Lord Jesus Christ, as first delivered to the Apostles and preserved in the teachings and traditions of the Church. We gather people from within and beyond the boundaries of the geographical parish, from many races and countries, united together in our love of the Lord and in our understanding that all people, regardless of ethnicity, background or lifestyle are equal before God and are our friends. You can be assured of a very warm welcome. You can find out more about the Clergy and lay members of our church on our Who’s Who page. The Parish Mass is at 10am on Sunday, sung with incense, and is celebrated according to the modern Western Rite. The Mass lasts about an hour and is followed by refreshments and fellowship. The Sunday School meets in the Hall at 10am and the children join us later in the Mass. Weekday Masses are daily at the advertised times. You can find out about the times of our Masses on the Mass Times page. Any downloadable items can be found on the Pewsheets Page for your reference. Information about the St Alban’s Singers including – sign up details, rehearsal times, downloadable items and music can be found here. You can hire the Church Hall for events, parties, meetings and long-term bookings, up to a capacity of 80 people. We take enquiries and bookings only on Saturday mornings between 10am and 12pm in the Church. Unfortunately we cannot take enquiries or bookings by telephone. We currently have vacancies for several mornings and afternoons on weekdays, and some Saturday evenings. We charge £40 per hour and require a deposit of £200 in cash. We offer discounts for long-term bookings. A smaller meeting room is also available for hire. 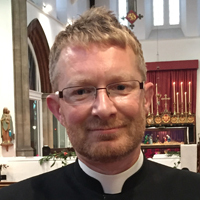 Fr Stuart Halstead has been the Parish Priest since July 2010. He was formerly a curate in the Diocese of St Alban’s and an assistant Priest at St Augustine’s, Kilburn in the Diocese of London. He is a member of the General Synod of the Church of England in the House of Clergy.